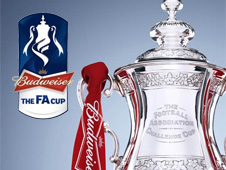 Wrexham edged their FA Cup replay against Cambridge to book a second-round trip to Brentford on 3 December. After a tight first half, Mathias Pogba put Wrexham ahead as he flicked Curtis Obeng's dangerous ball into the net. Obeng also laid on Wrexham's second with an even better cross from the right, allowing Danny Wright to head home against his former club. Michael Wylde headed a late goal for Cambridge, diverting James Jennings' cross, but Wrexham held their nerve. The first meeting between the two sides finished 2-2 and the Blue Square Bet Premier rivals again looked matched over the first 45 minutes at the Racecourse Ground. Either team could have broken the deadlock in the opening 20 minutes, with Joe Clarke seeing a shot deflected wide for Wrexham and Cambridge striker Michael Gash firing wide from close range. But league leaders Wrexham asserted themselves after the break to book their trip to League One promotion chasers Brentford in the next round. Pogba had been a thorn in the visitors' side and got the goal he deserved in the 59th minute, latching onto an Obeng cross before the same defender set up Wright in the 76th minute. Wylde gave Cambridge a glimmer of hope with three minutes left, nodding home a Jennings cross, but it was too little too late for Jez George's young charges. "We're out with much frustration and disappointment. "When you look at it overall they're a good side. I thought in the first 45 minutes they put us under no end of pressure. "But we dealt with the ball played forward early. I think we had the best chance of the first 45 minutes even though we were under the cosh for most of it. "The most frustrating thing for me is they never came out in the second half. We bossed the first 10-15 minutes of the second half and they score the first goal." 90:00+4:44 The referee brings the game to a close. Correction - 90:00+3:25 The official flags Danny Wright offside. Indirect free kick taken by Danny Naisbitt. 90:00+2:55 Lee Fowler takes the free kick. 90:00+2:55 Booking Michael Wylde goes into the book for unsporting behaviour. 90:00+2:46 Michael Wylde concedes a free kick for a foul on Jay Harris. 87:54 Unfair challenge on Danny Wright by Josh Coulson results in a free kick. Lee Fowler takes the direct free kick. 86:12 Assist by James Jennings. 86:12 GOAL - Michael Wylde:Wrexham 2 - 1 Cambridge Utd Michael Wylde grabs a headed goal from deep inside the penalty area. Wrexham 2-1 Cambridge Utd. 85:23 Corner taken by James Jennings from the right by-line to the near post, Neil Ashton manages to make a clearance. 83:46 Free kick awarded for a foul by Luke Berry on Danny Wright. Curtis Obeng restarts play with the free kick. 83:21 Jay Harris produces a right-footed shot from long range that goes harmlessly over the bar. 82:38 Corner taken right-footed by Joe Clarke to the near post, clearance made by Kevin Roberts. 80:15 Corner taken by Ashley Carew from the left by-line played to the near post, Neil Ashton manages to make a clearance. 80:15 Substitution Michael Gash leaves the field to be replaced by Ryan Charles. 79:53 Michael Gash takes a shot. Save by Joslain Mayebi. 78:37 Lee Fowler takes the outswinging corner, clearance by Ashley Carew. 77:49 Ashley Carew takes a shot. Save by Joslain Mayebi. 77:06 Short corner taken by Ashley Carew from the right by-line. 76:35 Jay Harris challenges Tom Shaw unfairly and gives away a free kick. Kevin Roberts restarts play with the free kick. 75:26 Curtis Obeng provided the assist for the goal. 75:26 GOAL - Danny Wright:Wrexham 2 - 0 Cambridge Utd Danny Wright scores a headed goal from inside the penalty box. Wrexham 2-0 Cambridge Utd. 74:41 Jake Speight fouled by Kevin Roberts, the ref awards a free kick. Neil Ashton restarts play with the free kick. 73:08 Danny Naisbitt restarts play with the free kick. 73:08 Substitution Luke Berry joins the action as a substitute, replacing Rossi Jarvis. 73:08 Substitution Harrison Dunk leaves the field to be replaced by Jordan Patrick. 73:08 The assistant referee signals for offside against Jake Speight. 68:02 Substitution Jamie Tolley goes off and Lee Fowler comes on. 66:57 Jamie Tolley takes a inswinging corner from the left by-line played to the near post, clearance by Kevin Roberts. 66:25 Free kick awarded for a foul by Michael Gash on Jay Harris. Neil Ashton takes the direct free kick. 64:07 Nathaniel Knight-Percival takes a shot. Save by Danny Naisbitt. 63:40 Josh Coulson gives away a free kick for an unfair challenge on Danny Wright. Direct free kick taken by Jamie Tolley. 63:01 Ashley Carew handles the ball and concedes a free kick. Free kick taken by Joslain Mayebi. 62:30 Jay Harris gives away a free kick for an unfair challenge on Ashley Carew. Kevin Roberts takes the direct free kick. 60:03 Tom Shaw concedes a free kick for a foul on Neil Ashton. Direct free kick taken by Neil Ashton. 59:23 Substitution Jake Speight is brought on as a substitute for Andrew Morrell. 58:17 Assist on the goal came from Curtis Obeng. 58:17 GOAL - Mathias Pogba:Wrexham 1 - 0 Cambridge Utd Mathias Pogba finds the net with a headed goal from inside the six-yard box. Wrexham 1-0 Cambridge Utd. 52:56 Ashley Carew takes a inswinging corner. 52:11 Harrison Dunk fouled by Curtis Obeng, the ref awards a free kick. Free kick crossed right-footed by Ashley Carew, clearance by Mathias Pogba. 49:52 Long range shot from Danny Wright misses to the left of the target. 49:15 Inswinging corner taken left-footed by Michael Wylde from the right by-line, clearance made by Mathias Pogba. 48:43 Free kick crossed left-footed by James Jennings from right wing, clearance made by Neil Ashton. 48:43 Booking Neil Ashton is shown a yellow card. 48:15 Neil Ashton challenges Ashley Carew unfairly and gives away a free kick. 47:40 Booking James Jennings is cautioned. 45:00+1:12 It is the end of the first-half. 45:00+0:37 Free kick awarded for a foul by James Jennings on Jay Harris. Direct free kick taken by Curtis Obeng. 44:07 Inswinging corner taken right-footed by Jamie Tolley from the left by-line, clearance by Ashley Carew. 43:08 Rossi Jarvis gives away a free kick for an unfair challenge on Andrew Morrell. Neil Ashton restarts play with the free kick. 39:32 Unfair challenge on Michael Wylde by Danny Wright results in a free kick. Direct free kick taken by Danny Naisbitt. 37:42 Mark Creighton challenges Liam Hughes unfairly and gives away a free kick. Josh Coulson takes the direct free kick. 35:58 Danny Wright concedes a free kick for a foul on Michael Gash. Danny Naisbitt takes the direct free kick. 34:51 Neil Ashton decides to take a short corner. 34:31 Inswinging corner taken by Jamie Tolley from the left by-line, Michael Wylde manages to make a clearance. 34:03 Ashley Carew takes a shot. Save made by Joslain Mayebi. 32:49 Jay Harris challenges Harrison Dunk unfairly and gives away a free kick. Free kick taken by Josh Coulson. 31:13 Michael Gash gives away a free kick for an unfair challenge on Mark Creighton. Free kick taken by Joslain Mayebi. 30:40 Joe Clarke gives away a free kick for an unfair challenge on Michael Gash. Direct free kick taken by Danny Naisbitt. 28:50 Inswinging corner taken left-footed by Neil Ashton, Nathaniel Knight-Percival has a headed effort at goal from close in which goes wide left of the target. 28:19 Inswinging corner taken right-footed by Jamie Tolley, Michael Gash makes a clearance. 26:16 Foul by Nathaniel Knight-Percival on Michael Wylde, free kick awarded. Direct free kick taken by Danny Naisbitt. 25:38 The referee penalises Tom Shaw for handball. Jay Harris takes the direct free kick. 23:41 Shot from just outside the box by Mathias Pogba goes over the bar. 22:42 The assistant referee signals for offside against Tom Shaw. Free kick taken by Joslain Mayebi. 18:11 Michael Wylde fouled by Andrew Morrell, the ref awards a free kick. Tom Shaw takes the free kick. 17:41 Close range effort by Michael Gash misses to the right of the goal. 14:57 The offside flag is raised against Liam Hughes. Free kick taken by Mark Creighton. 14:26 Foul by Mark Creighton on Michael Wylde, free kick awarded. Danny Naisbitt takes the direct free kick. 12:35 Inswinging corner taken by Neil Ashton from the right by-line. 12:01 Corner taken right-footed by Jamie Tolley, clearance by Michael Gash. 9:07 Free kick awarded for a foul by Michael Gash on Joe Clarke. Direct free kick taken by Neil Ashton. 5:38 Jay Harris concedes a free kick for a foul on Harrison Dunk. Free kick taken by Tom Shaw. 1:58 Corner taken by Neil Ashton from the right by-line to the near post, clearance made by Tom Shaw.